Dwarf galaxy with a total and stellar mass of 10^9 and 10^6 solar masses, respectively. The feedback from the first stars induce a 10-50 million year delay in star formation in the growing dark matter halo. However once the halo accretes enough dark matter and baryonic mass to effectively cool, and thus condense to high densities, star formation can once again commence. The stars that form in these small galaxies are enriched by earlier supernovae, some of which are from Population III stars. This provides a direct link from the first stars to these dwarf galaxies. A small fraction survive until the present day, populating the outskirts of the Milky Way and the Local Group. By quantifying the effects of Population III stellar feedback on dwarf galaxies, we can deduce the properties of the first stars and the physical conditions during the first billion years of the universe. Our simulations have the resolution and breadth to follow both the formation and feedback of Population III stars and the ensuing birth of the first galaxies. 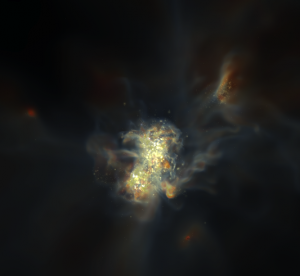 In the near future, our simulations will connect these formation scenarios to local dwarf galaxies that can be observed in much better detail than their very distant counterparts.